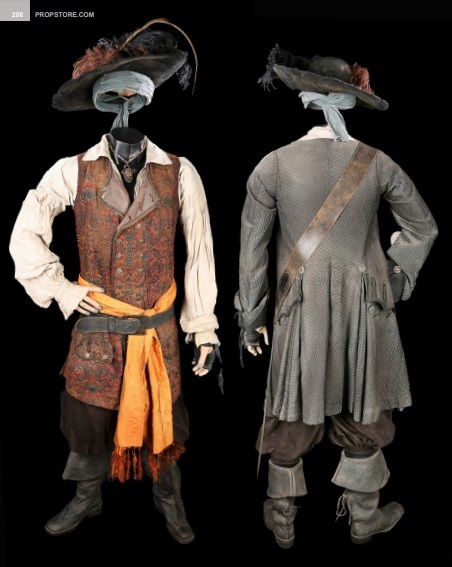 Geoffrey Rush’s Captain Barbossa costume from Pirates of the Caribbean: The Curse of the Black Pearl will go under the hammer in London September 20. Auctioned alongside the pirate costume is Barbossa’s peg leg and an array of rings worn by Johnny Depp as Captain Jack Sparrow. Other pieces listed in the auction catalogue include Xenomorph costumes from Alien, Star Wars costumes and the Witch-king of Angmar’s crown from Lord of the Rings: The Fellowship of the Ring. The pirate costume is composed of a large felt hat with feathers, a long grey coat, an off-white linen shirt with pleated sleeves, elaborate waistcoat, pleated trousers and bucket boots. The accessories include a rubber stunt flintlock pistol, a leather baldric and sheath, a metal pendant with ornate serpent designs on a metal chain, a leather fingerless glove and a green bandana. “An orange fabric sash and a replica sword have been added to complete the look of the costume, which is also accompanied by several costumier tags and Walt Disney Company certificates of authenticity,” said Propstore. 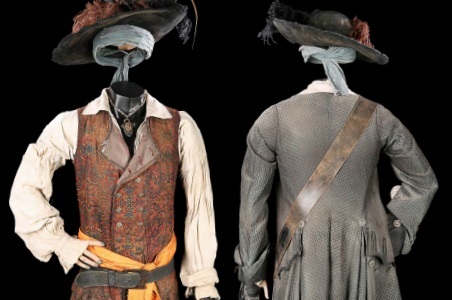 “Much of the costume has been distressed to give it the worn-in appearance of real pirate garb with fading to the hat, bandana, vest and boots. A hole is present in the sole of the left boot for display purposes. The stunt pistol also shows signs of age, with some cracking to the paint finish. Presented on a custom-made display base, the costume remains in very good condition.” The auctioneers’ estimate stands at £30,000-50,000. Too much for you? Have a look at our selection of cheap pirate costumes here. Also on sale is Captain Barbossa’s peg leg from the sequel Pirates of the Caribbean: On Stranger Tides. 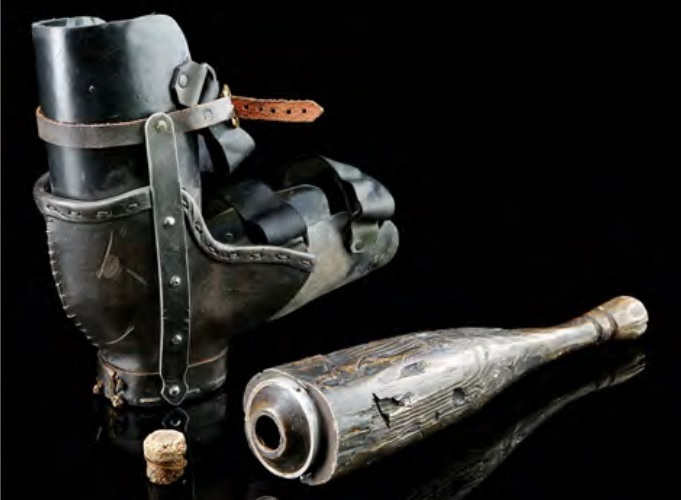 Designed to be worn with a bent leg, the piece consists of a resin peg leg that is attached to a rig. The wood-effect prospthetic includes a removable cork at the top, allowing the piece to double as a flask. The peg leg shows minor signs of wear from production use, such as dirtying to the padding and scratches throughout, but remains in very fine overall condition. With an estimate price of £3,000-5,000 you might not make much of a saving in avoiding bar prices. 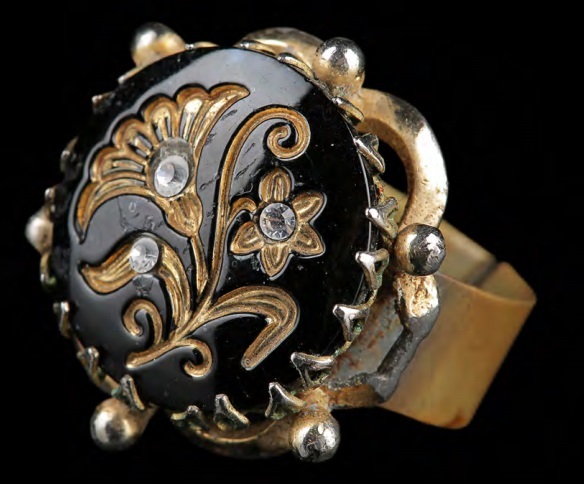 Johnny Depp’s Spanish Flower ring from Pirates of the Caribbean: On Stranger Tides (image) is estimated at £3000 – 5000.